I acquired a free guitar earlier this month, so I spent a few hours pulling it apart yesterday. It is a Squier II Stratocaster, which is a licensed-by-Fender clone made in Korea. 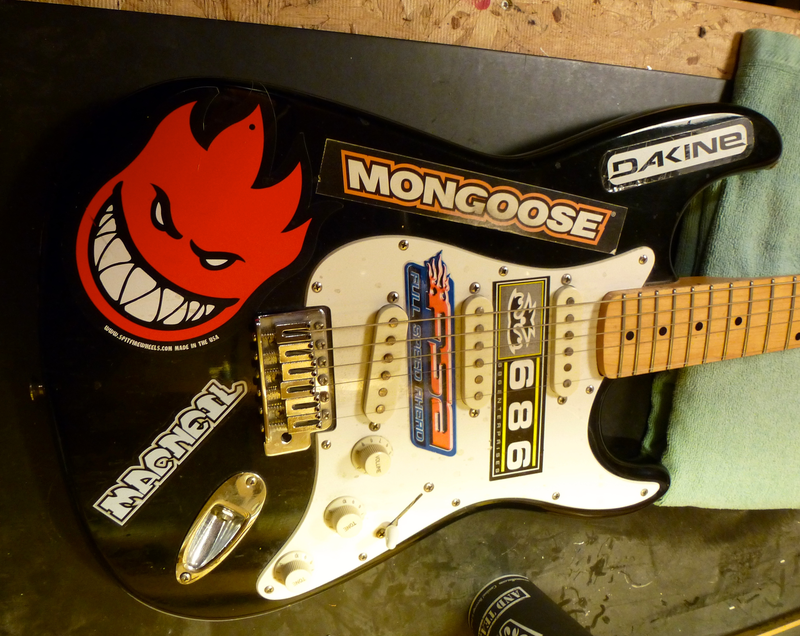 Its body shape is different from a standard Stratocaster. I don’t know if that is normal for Squier II’s. The end of the body (left side of the picture) is angled toward the top bout, the top bout itself seems to be a centimeter or two closer to the headstock, and the rear bout is about as far away from the headstock. The whole thing looks 1% sleeker than a regular Strat. It is also covered in stickers. I like to breathe new life into free instruments, so these images are the beginning of a longer project. First, I want to get rid of the stickers and replace them with something painted (I accept proposals: Tweet me and we’ll arrange something). 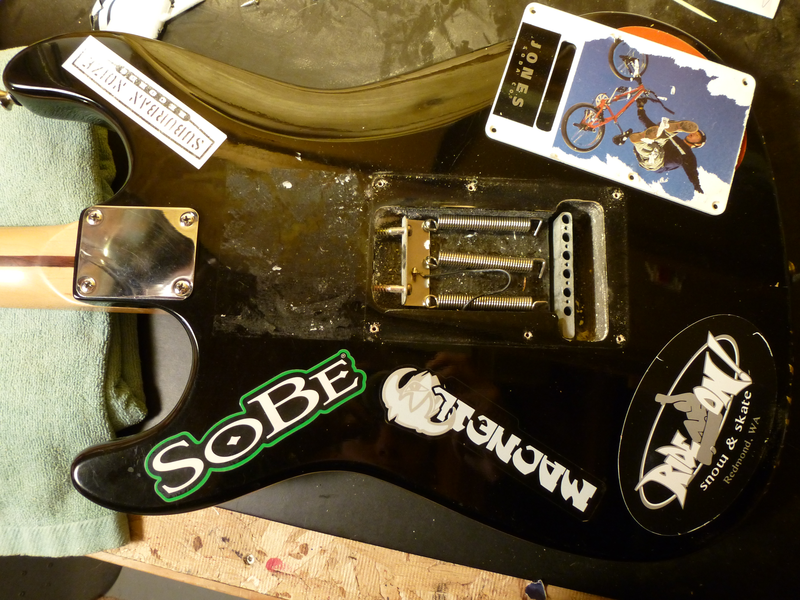 Second, I intend to replace the pickups with one Seymour Duncan Custom Custom that needs to be used. Finally, I will replace the bridge and tuning pegs; with what I am not certain. Does that mean I will reuse the guts? Possible. The Volume potentiometer is so easy to turn that it does not stay at full volume, though the Tone pots are stiff enough to stay still. One of them may become Volume pot. The neck is clean and ready to re-use. I am not sold on its profile (thick for my hands) but there is no immediate need for replacement. The bridge is floating – meaning that it does not touch the guitar’s body until the strings are relieved of tension – and I do not like floating bridges. Whether I will simply block the existing bridge or replace it is open to debate. I’ll leave you with the last two relevant pictures: the back of its body and its neck. Look forward to more photos of this project as I tear it down and then build it back up!